Despite having “claims” on inventing numerous things, baseball is most likely not one of them and the story is completely fabricated (as some of you seemed to have seen right through). Don’t feel bad if you were taken in – it can’t be half as painful as thinking that your newlywed husband is being exiled from the country. See, visas are dodgy in China. Even when they’re legit, they’re often not legit. Relationships come into play, money changes hands, the right people are super-saturated in baijiu and hongshao rou. The simple truth is, 90% of the language schools operating in China don’t have the ability (legally) to get you the proper working (Z type) visa. Knowing this, despite me having a legit visa (now), I solemnly walked into the living room yesterday morning and told Maggie that I had just got a rather terrible e-mail from my boss. It stated that the police had caught on to some false paperwork he had submitted and they are revoking my visa – requiring me to leave the country right away. Hook. Line. Sinker. She swallowed ’em all. One look at the very-real fear in her eyes though and I melted. I couldn’t keep it going. Anyway… a few others have been up to some Aprilfoolery around the sphere. Top of the bunch has got to be the boys at Sinocidal with their “re-imagining” of two of China’s premier English-language blogs – China Law Blog and Sinosplice. Regular readers know we are always talking about the huge opportunities for environmental/green businesses in China. After all, we are on Part XI of our “Is China Going Green?” series. 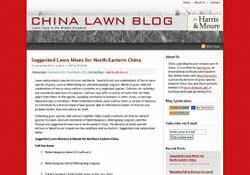 Well today, we have decided to put our money where our mouth is and open a sister blog dealing strictly with Chinese lawn care and related horticultural issues. And never a guy who wants to be left out of a bit of fun, Lonnie’s OneManBandwidth had a wonderfully engaging article about a the source of the tallest man in the world’s height – a Mongolian miracle grow formula created from distiled sheep bile. There is already a huge underground market for the extract which is being called “Woolhite” in back alley pharmaceutical shops. Hong Kong authorities have already seized 330 million HK Dollars worth of the drug headed overseas and warn that side effects of poor production can include aimless wandering, sleep disorders, and uncontrolled bleating. Thanks for the laughs guys. It sure as hell beats saranwrapped toilet seats. See all Entertainment/Reviews, Farrago, Humour, Special Days posts. Man, Google ads are smart. 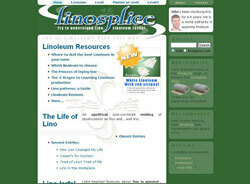 It is running an ad on your blog right now for the envirolet waterless toilets. Apparently it picked up on the green aspects of your post, along with your saran wrapped toilet seat comment. @CLB: And you never know when a reader may be looking for envirolet waterless toilets. Agreed though, Google is one smart cookie. Just do a search for “answer to life the universe and everything” (minus the quotes) and it’ll prove it. Hook. Line. Sinker. She swallowed ‘em all. One look at the very-real fear in her eyes though and I melted. Very cruel. She didn’t give you a good punch in the stomach for this? Yesterday seemed to be a big toilet day as Google announced its free wi-fi through the toilet bowl system. So I ran the search and the answer is 42. Not a big Douglas Adams fan? I am basically a philistine. I do get it now. Damn.